Clearaudio Emotion SE review | What Hi-Fi? It's a shame Clearaudio chose to call this record player the Emotion SE. We're big fans of the standard Emotion, but this new deck is far more ambitious, and the price difference between the two models – around £740 – reflects that. Look carefully and you'll find a whole raft of changes from the cheaper player. The SE has a thicker acrylic chassis and heftier platter: both add solidity and substance. The main bearing – the one the platter spins on – is a version of Clearaudio's impressive ceramic magnetic design. Here, the bearing is aligned by a ceramic spindle, and floated in air by a magnetic field. The lack of direct contact between moving parts means the bearing is immensely quiet. The partnering arm is equally impressive, as you'd expect from something costing £870 on its own. 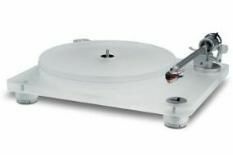 It's snappily called the Satisfy Carbon Direct Wire, and uses sapphire and ceramic bearing, woven carbon-fibre arm tube and a single piece of wire from the cartridge to the phono plugs. An Aurum Beta-S Wood moving-magnet cartridge completes the package. At £425, if bought separately, it comes in near the top of Clearaudio's moving-magnet range and uses a body made of a strong South American wood called Satiné. The Emotion SE is a solid design without any form of suspension. This has the advantage of making set-up relatively simple (though we'd like a better written manual) but means the deck is hugely sensitive to placement. The standard rules about keeping the deck as far from the speakers as possible and putting it on a dedicated, rigid rack apply, and care in these areas will make a difference to performance. Once set up properly, the Emotion SE is a class leader. It's a very clean-sounding package. Perhaps there's a touch of excessive brilliance in the treble, but in any well-behaved system this shouldn't be a problem. Anyhow, you'll be too busy noting the huge level of detail on offer, and revelling in the deck's agility to worry about that. No matter what music you play – we went through a raft of discs from REM's Automatic for the People, to Bob Marley's Catch a Fire, to Dukas's The Sorcerer's Apprentice – the SE takes it all in its stride. There's strong dynamics, impressive stereo imaging and a transparency that's hard to better for anything like this money. Timing is good too, promoting a good sense of momentum as and when the music demands. As an all-rounder the Emotion SE is tough to beat for the money. It sounds great, and looks elegant, too. Build quality and finish are up there with the best at this price point, and ease of use is good. Sure, we'd prefer it if the deck wasn't so fussy about siting, but even the very best turntables typically demand such pampering. The SE can stand toe-to-toe with any rival below the two grand mark. It really is that good.